Who is the Mackinac Center and why is it attacking the MEA? 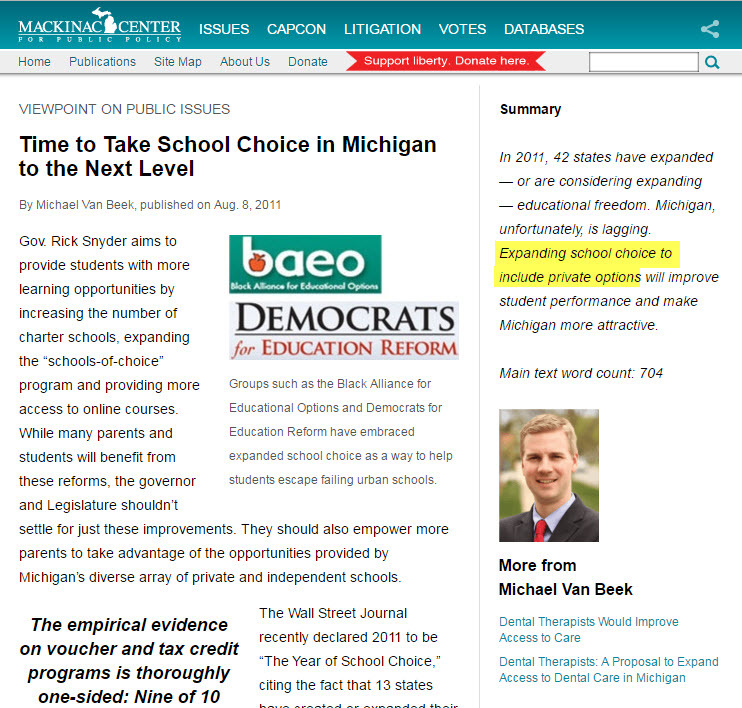 • The Mackinac Center bills itself as an independent think tank, but it’s actually funded by corporations that want part of the $14 billion public schools budget. • The Mackinac Center pretends it wants teachers and school employees to save money, but it’s responsible for every recent pay and benefit cut imposed on them. 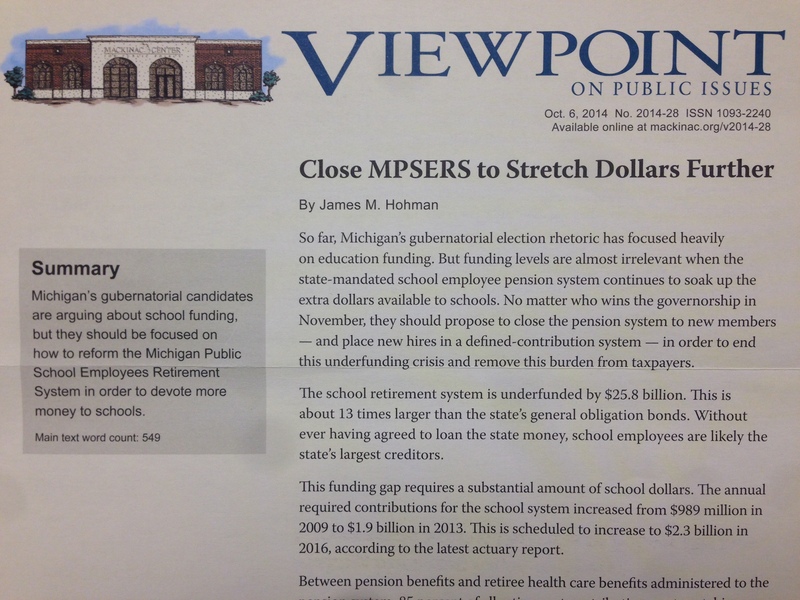 • It wants to shut down the state pension system. Including MPSERS. 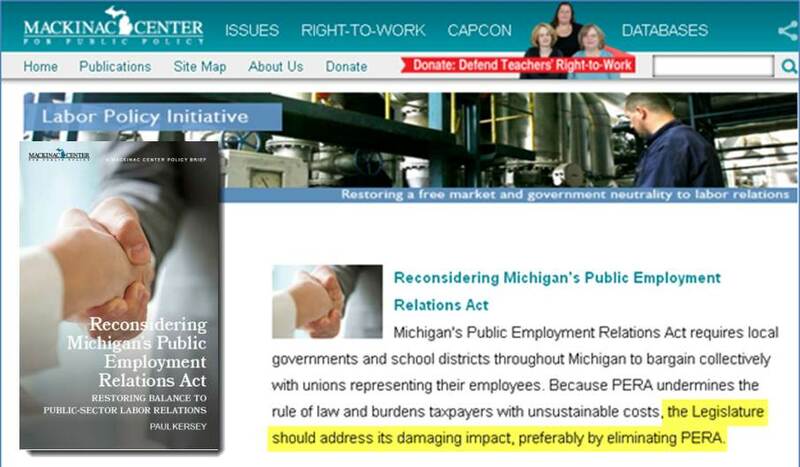 • It wants to outlaw public sector bargaining in Michigan. • It’s trying to turn members against the MEA so its corporate funders can cash in on public schools by converting them to private companies. •The Koch Brothers, the Devos family and Exxon fund its operations. • It writes anti-worker legislation promoted nationwide by ALEC. Why does the Mackinac Center want MEA members to quit? • The Mackinac Center works through the Legislature to weaken the MEA, giving it less political muscle. The fewer members it has, the fewer political dollars it can raise and the fewer bodies it can turn out in an election. • If it can severely weaken the MEA, its corporate funders can move on to privatize (monetize) the public schools, through many more privately run charter schools, private on-line cyber schools, and vouchers. If I follow their advice and quit, what do I lose? • The satisfaction that you’ve seen through the Mackinac Center’s lies. The Mackinac Center and the other right wing think tanks have been at it so long no one can see the obvious deceit they peddle. We need more sites like this one. I am all for the MEA but for many years being a member it was also self serving and if you think back to Engler it was the start of the battle between the Right Wing and MEA. I think the MEA needs to examine it’s own mission and service to it’s members. I am still pro MEA but a little more tempered. John Engler, really, you want to throw your hat in the ring with John. Did you miss that he was the governor of Michigan who ILLEGALLY stopped funding retirees health insurance, was told to do so by the Michigan Supreme Court, and still refused. John Engler, really?! Did you miss the additional 3% contribution to your retiree health insurance from 3 years ago that you must pay even it you never collect anything from the fund? Thank John Engler. This is what I think the MEA’s mission and service should be: protecting members’ jobs through contract negotiations, member consultations and litigation for teachers under fire. Since the Engler age, we’ve had to also take on direct attacks on public education. The right wing attacks have only intensified with the Snyder Administration. So, now we’ve added to the plate of what our union’s mission and service must be—protecting our jobs through lobbying and litigation to prevent and fight laws that have been written to strip members of rights, end public education, and end unions. Furthermore, now MEA have to fight freeloading members, with Mackinac Center’s help, who want to sue our union for not helping them freeload. The right wing attacks have been numerous. So, MEA has been lobbying for fully funded public education, teacher tenure, teacher evaluations, our healthcare benefits , (and on and on) while lobbying against, RTW, dues collection deductions, cyberschools, charters, and EAA. I’d say they’ve had their hands full and as far as I can see they’ve been holding to the mission and providing the service, I as a member, demand. This is what I ask: Has our membership held up it’s part of being a union member? It’s not just paying your dues and union leadership will do all the work. Unions’ won what they have by working together collectively. Right now, we need all of our members working together. When will ALL of our union members stand up and act like union members and help fight back? It’s not what your union can do for you, but what you can do for your union. That’s what UNION is–members collectively acting together to improve and protect their jobs. This is NOW! I don’t understand how groups that clearly represent the interests of for profit corporations can claim charity status. I feel like I’m going crazy sometimes. What is “charity” about stealing students education? I second your question. You are so right. We have to see through their lies and deception. They are nothing but puppets for Devos and company. MEA members let’s stand strong together! It’s time for the attorney general to look into the 501 status of this “non-profit”. It seems there are some clear violations of this tax code. Oh! That’s right, the attorney general IS pro-Mackinac Center. Silly me! A great reason to help elect Mark Totten for our attorney general. The rightwing, anti-union Mackinac Center has some very deep pockets thanks to the millionaires and billionaires like DeVos family and the Koch brothers, so they love to find a few teachers out of the thousands that support their union and back them in court. First it’s the teachers, and then the Mackinac Center will go after the other unions. Divide and conquer. Yes, we must stand together. Money talks but truth walks in the hallways and classrooms of public schools. Great to see MEA not rolling over and playing dead!